My opinion is that automated stats gathering for non-system objects should be disabled on Oracle Data Warehouses across all environments. All it does it cover up poor design or implementation which has omitted to consider statistics management. Once you get into the realms of millions or billions of rows of data, the automated housekeeping may well not have time to stat all of your tables on each run. And then it becomes a quasi-lottery when your tables will get processed. Or what if you’re working with intra-day loads (eg. near real-time) – the housekeeping job only runs once a day by default. Even if you have a suitable window and are happy that the job gathers all that it needs to all of the time, what if you want to run your batch at the same time as the task window defined? If you want to run your batch highly parallel (and why wouldn’t you?) then will the stats gather suffer? or affect your batch by running stats highly parallel too? Suppose you are relying on the auto stats job, and don’t want to run it at the same time as your batch, so you come up with a suitable schedule for them to run at different times. What happens when your DW grows and you need to add a new batch process, and so have to move the window again? How do you know that moving it won’t affect the previous batch’s stats? If you’re building on an existing system and want to test the performance of your new batch, how are you going to simulate the behaviour of your auto stats job? Even if you trigger it manually, are you going to accurately simulate the statistics that it may or may not need to gather each night? How do you factor in the magical 10% staleness to trigger a stats gather? That is one serious test rig if you want to reproduce all of that. If you have stats management in place, then turning the auto stats off (for non-system objects) won’t hurt. And if you’re not, then the auto stats job will cover this up in your environments all the way from Dev through to Prod. The first time someone will ask about stats management is when you’re scratching your head over a report or ETL stage “that used to work fine”. And then the horrible truth will dawn that you screwed up, and should have built it into your design from the beginning. If you can’t disable the autostats job for whatever reason (maybe another application on the same DB would require changes to accommodate it), then you can shield yourself from its nefarious influences by using LOCK_SCHEMA_STATS to lock the stats on your schema(s). When you manually maintain the stats yourself, you either unlock them first, or use the FORCE option of the stats procedures. It’s easy enough to understand why Oracle built the Automated Stats job, and why it’s enabled by default. In an effort to move towards the Self Managing Database, it makes sense to automate whatever you can, so that the scope for poor performance is reduced. Abstracting things slightly, the optimizer is just part of the DB code, and stats reason for being is to support the optimizer, so why not keep it under the covers where possible? The trouble with this is that it might be fine for the middle of the road. The bog standard, quick-win, fire it and run project doing nicely standard OLTP work. One fewer thing for the developer to worry about. It’s probably quite good for lots of things. But Oracle RDBMS is a big beast, and an expensive bit of kit. Do you really want to meander along in the slow lane all the time, content to be using a one-size-fits-all approach? If you’re serious about exploiting the power of Oracle for your data warehouse, then you need to understand what needs to be done to get it to perform. One of the big factors is accurate, representative statistics. 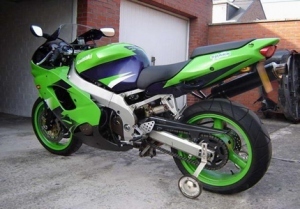 And to get these you have to take the stabilisers off and learn how to do it properly yourself, because you’re the one that understands your data. Data loads are going to be different, data distribution is going to be different, reporting is going to be different. There’s a finite set of patterns that you’ll find in standard DW methodology, but it’s up to you to read about them (Greg Rahn, Doug Burns, et al) and understand how they apply to your system, and not rely on Oracle’s approximation of a stats method for an average system. Why do I need to manage the stats myself? Doesn’t Oracle do it automagically when they’re stale? Doesn’t Oracle gather stats automagically when they’re stale? not stale ≠ representative stats . Or to rearrange the equation: your stats can be unrepresentative of your data, and the stats not be ‘stale’. So even whilst they’re not “stale”, that’s not to say the global statistics for your table are still representative. After one day, the statistics are already becoming unrepresentative of the data (think max value of date, transaction number, etc), but are still not “stale”. Oracle will, by default, consider a table “stale” once 10% has changed. But most DWs are going to be loading many millions of rows a day, so the 10% (default) change for a table to be considered stale is going to be quite high. A table loading 20 million rows per day will hit c.1 billion rows in total after less than two months. But of a billion rows, a hundred million (10%) need to change before the table’s statistics are “stale”. 20 into 100 goes 5 … so your statistics would only become “stale” roughly every five days. At least two of these (data skew, and column low/high values – out-of-range) can occur (which is bad, mm’kay?) with statistics which are STALE=FALSE. The point is, if you’re serious about getting the best explain plan from the CBO, you can’t rely on STALE as a sole indicator of how representative your statistics are of your data. Let’s remember why we even care about good statistics. Some people seem to think that it’s optional. That it’s the geek equivalent of spending every weekend lovingly polishing the exterior of one’s favourite car – nice to have and ideally should be done, but ultimately just for show and won’t make it go any faster. Our requirement is for performance, and repeatable, consistent performance. To get this we want Oracle to execute the query as efficiently as possible. To do this, Oracle needs to understand the data that it’s being asked to query. If it doesn’t understand the data, how can we expect to access it in the most efficient way? This understanding is imparted to Oracle through statistics. So statistics need to be representative of the data. As soon as you are changing data (eg a DW batch load), you need to consider whether the stats are still going to give the CBO the best chance of getting the right plan. If they aren’t as representative of your data as they could be then you can’t expect the CBO to come up with the best plan. If your data doesn’t change much and once a week works for you then great. But the point is you need to understand your data, so that you can plan your statistics strategy around it so that Oracle can understand it. 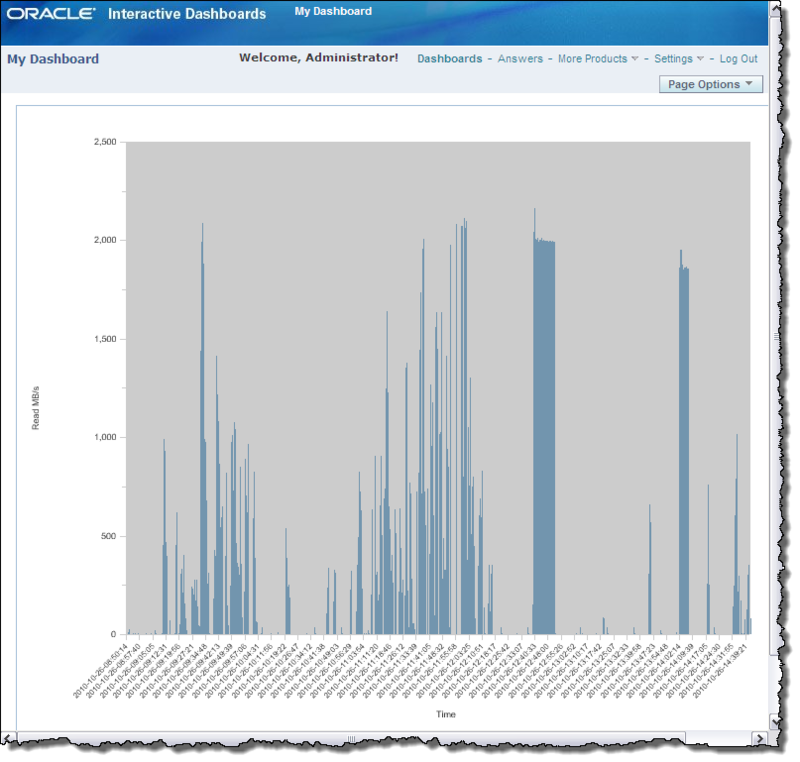 I’ve been doing some work recently that involved the use of Materialised Views on Oracle 11g (11.1.0.7), particularly around PCT refresh. There are some things that are not clear from the documentation, or are actually bugs so far as I’m concerned, and I’ve detailed these below. In this example I was working on part of a DWH with c.2 millions rows aggregated up daily. One of the things that I spent a long time trying to get to work was Partition Truncation when using PCT refresh. 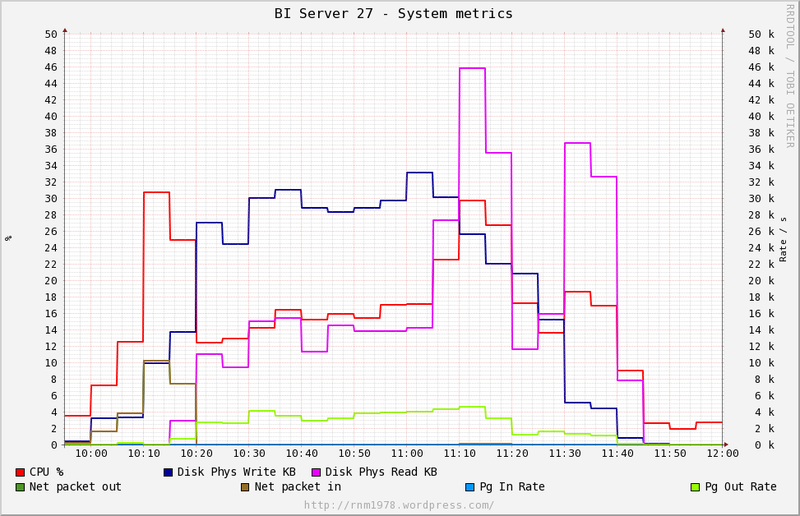 We had tried and discarded “FAST” refresh as being completely non-performant for our volumes. There was something about PCT that confused me for a while, and so maybe other thickos like me will also be confused so I’ll clarify it here: PCT is about Tracking the Change on Partitions of the detail table. It can have interactions with a partition on an MView, but this is not where its terminology refers to. From what I read in the documentation, this is what PCT would be expected to do. However, it didn’t work like this for us at first. Note: this is what we did to get it to work; it may be that other versions differ particularly around the _mv_refresh_costing parameter and its default value. I presume there is standard disclaimer around using undocumented parameters too. See here for the documentation regarding PCT partition truncation. If you think about this it makes a lot of sense. PCT is about tracking change on the partition of the detail table, and so if data in this partition changes, Oracle must be told how this relates to the data in the MView, so that it can refresh just the relevant subset of it. An example of the former (partitioned on the partitioning key of the detail table) is base table and aggregate MV both partitioned on Store, or Warehouse, etc. This undocumented parameter is at the very heart of getting PCT partition truncation. By default it is set to Rule, which means that you will get DELETE … INSERT and never TRUNCATE…INSERT. There is a document on My Oracle Support: PCT REFRESH ISSUES DELETE WHERE IT SHOULD ISSUE TRUNCATE (Doc ID 733673.1). N.B. Despite the ‘TRUNC’ in the name, “PCT – DEL/TRUNC” does not do a TRUNCATE – maybe the name comes from DELETE being used as a kind of TRUNCATE? Our elation at seeing a TRUNCATE occur was short-lived, because the refresh still took ages to run. After a bit of head-scratching and more RTFMing, we found that the reason for the slow refresh time was down to a default global index that is created on MViews. Named I_SNAP$. […], they are used when you do “fast” (incremental) refreshes, using the mv$log tables. However, if you’re only doing PCT refreshes of a MView, they are a positive hindrance because they need rebuilding every time. On an MView with millions of rows this takes a long time. You can also use method=>’?’ where Oracle will try PCT first, and then Complete if PCT is not possible. However, if PCT isn’t possible you may have a problem that you want to know about rather than rebuilding the MV each time without you being aware of it. Interval partitioning removes the headache of partition management for new data. Unfortunately, it appears that you can’t partition MViews and refresh them using PCT partition truncation. You don’t get the error if you do a non-atomic refresh – but if you do a non-atomic refresh you don’t get partition truncation (you get DELETE instead). This will probably have some people exclaiming “serves you right …” but ANSI SQL joins (INNER JOIN etc, instead of joining tables in the WHERE clause) is what I was brought up on. I discovered after several frustrating hours that you shouldn’t use it when you define MViews, as it can result in an erroneous “COMPILATION ERROR” state for the MView when data on the base table is changed. There’s a of MOS article: Mview Refresh Fails And COMPILE_STATE => COMPILATION_ERROR (Doc ID 1081493.1), which refers to bug 5759944 and for which there’s a patch number. It’s supposedly fixed in 11.2 but appears to still be present in 11.2.0.1.0. Next follows the statements that Oracle would execute, for all of the MV refresh methods that it thinks are applicable in this refresh scenario. Method 4 is a DELETE … INSERT, whilst Method 5 is TRUNCATE … INSERT. Watch out for this parameter value – it’s crucial! Even though there was no error returned to the user session calling the refresh, I figured this must be some problem. However, according to MOS doc Errors In Refresh Snapshot Trace Files ORA-10980 (Doc ID 294513.1) the parse error is raised and cleared internally and therefore nothing to worry about. The doc has some other useful links including ones like the above white paper which are not solely Exadata related. Continuing in the beard-scratching theme of Unix related posts (previously – awk), here’s a way to graph out the I/O profile of your Oracle database via the Oracle metrics in gv$sysstat, and gnuplot. This is only the system I/O as observed by Oracle, so for belts & braces (or to placate a cynical sysadmin ;-)) you may want to cross-reference it with something like sar. Why would you want to do this when you’ve got a pretty GUI in EM/Grid and flash graphs? Because the data in EM is averaged out over a relatively large sample (one minute for recent history, and whatever your AWR samplerate is for older history) and thus lower than the point-in-time I/O being driven through your server. My previous post (The danger of averages) illustrates this. For identifying bottlenecks or capacity planning, you need to know how much I/O throughput you really use. Consider this rough example: Using V$SYSMETRIC_HISTORY you can get an average over the last minute. 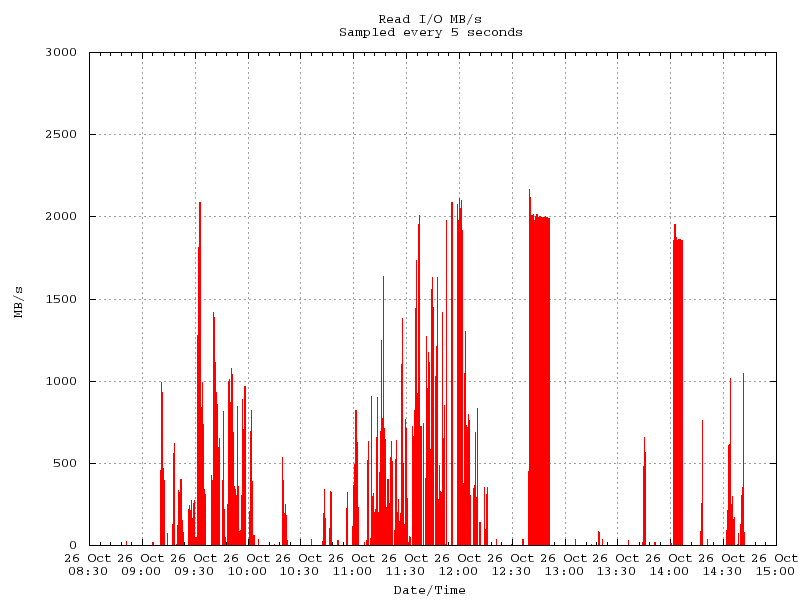 For the first 30 seconds of this sampled minute you ran a query consuming I/O at 100 MB/s. For the last 30 seconds there was no system activity. V$SYSMETRIC_HISTORY shows a figure of 50 MB/s, as this is the average over a minute. You look at your system’s IO profile in EM and see 50 MB/s. Your hardware guys tell you that the system has a capacity of 100 MB/s throughput, so you think you’re well in the clear for capacity, when in reality you’re already hitting it. Now, what happens when two instances of this same query – each requiring 100 MB/s – runs? It will take twice as long when run concurrently (because they’ll have to share the throughput available, and thus get ~50 MB/s). It might be that this is acceptable, that the trade-off of hardware cost to increase I/O throughput capacity isn’t justifiable for making the queries run faster. But it’s important to be aware of the bottlenecks in a system so that they can be mitigated and considered in any capacity planning. I wanted a quick way to visualise the data, and also to plot it out once it was over the number of rows that Excel will chart at once (32k I think). gnuplot was the answer, but it’s a bit of a sod to get running as a fire-and-forget so here’s a help. For ease of use it copies the file generated by the above script to your local machine. If you don’t want to do that then remove the scp line. It uses sed to convert bar (|) characters to Space ( ), as gnuplot requires whitespace separated columns. tr would probably do the job too. set title "Read I/O MB/s\nSampled every 5 seconds"
This was written on cygwin, and presumably should work on any ‘nix system.